Is the Greek Tragedy About to Erupt? HomeBusinessIs the Greek Tragedy About to Erupt? While US markets tease the bears near a possible top, the action is over in Europe. A Euro bond offering failed to complete in German Bunds, the first failure in over a year. Greek CDS spreads rose to record highs, and the Euro has dropped for the fifth consecutive day. German opposition intensifies to a bailout of Greece. Leaks indicate that the cost of the bailout may be more than twice as high as previously thought. Shanky’s technical analysis site has a good summary. The Greek 10 yr bond yield is rising another 40 bps to 8.25%, the highest since Oct ‘98, the 2 yr yield is up 35 bps to 7.65% and 5 yr cds is up 25 bps to 485 bps and is fast approaching the Ukraine. Portugal continues to get dragged into the mud as their 10 yr yield is up 17 bps to 4.79%, the highest since March ‘09 and 5 yr cds is up 20 bps to 220 bps. The macro-economic speculation is that the Euro may be acting as that “barbarous relic” which caused serious problems in the early 1930s. Keynes thought that adherence to a gold standard had limited the ability of distressed countries to reflate their currency. Brad Delong (Keynesian professor at Berkeley) has a chart to capture this point, below. Question is whether keeping Greece on the Euro will prolong their travails vs letting them go back to the drachma and inflation. 1 Comment on Is the Greek Tragedy About to Erupt? 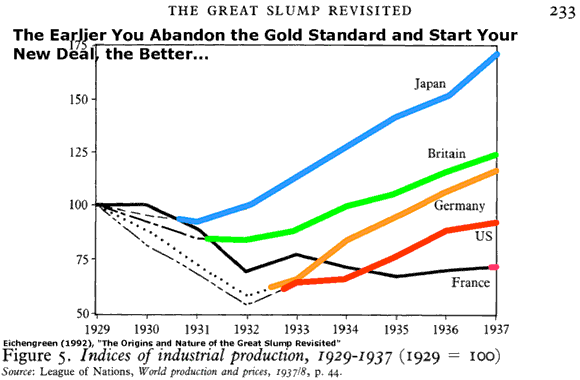 The effect of leaving the gold standard was minor, although not de minimis. Remember that both Hoover and Roosevelt were liquidationists, Keynes had no notion of sustained economic growth: his interventions were STRICTLY to preserve the financial system. You’re reading backwards–don’t do that. While the economy recovered somewhat from its state in 1933 the unemployment rate remained in the 15 percent range for the rest of the decade. The unemployment rate did not drop from depression levels until the economic impact of World War II was felt. The level of production did recover its previous high level of 1929 fairly quickly but this was still significantly below what the economy was capable of producing.